If you find it difficult to tear yourself away from spring migrationwhere you live, you are not alone. But experiencing migration in another part of the world can be an amazing experience. If you are serious about birding, Israel is one of those places that should not be missed. It lies in a critical spot for birds migrating between Europe and parts of Asia and Africa and is one of those hotspots that just never lets up. When birds make the trek north along Africa’s East coast after overwintering, the shortest route over water to Europe and Asia is through Eilat. In spring, migration can be an extraordinary experience. So it’s no surprise that every spring Swarovski Optik sponsors a Champions of the Flyway birding competition benefiting bird conservation (see our following article). I was in Eilat in April a couple of years ago and visited the Birdwatching Park and Research Center run by Birdlife International partner SPNI (Society for the Protection of Nature in Israel). Apart from the songbirds and many shorebirds in Eilat, I was struck by the quantity of raptors during spring migration, following smaller birds over land. I was able to spend a couple of days birding in the desert with Noam Weiss who runs the Eilat operation where they are working hard to restore wetlands which are critical to the survival of shorebirds making their migration through Israel. Levant’s Sparrowhawks were in full migration mode when I was there, and flocks of thousands at a time were darkening the sky. So many so, that Noam needed to call the Eilat airport to let them know when these huge flocks were coming through, so for safety the airport could suspend operations until the birds passed by. One of the things that makes SPNI so effective is that they work very closely with locals to educate people and businesses and make conservation practical.So notifications like this one are all part of a normal day. The list of raptors we saw is long and includes Steppe Eagles, Booted Eagles, kestrels, Osprey, Snake Eagles to name a few, but the Levant’s Sparrowhawks were truly the stars en masse that week. Shorebirds were another highlight both at the wetlands at the Birdwatching Park and at the sewage and salt pans along the Jordanian border. Pretty much any shorebird, tern, gull or wader you might expect to see in Europe later in the season was there fattening up to make the rest of their trip northward to breed – Greenshank, Ruddy Turnstone, Stints, Dunlin, herons, rails – and many more. 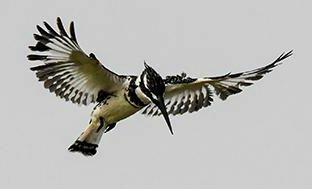 And if you are a photographer, SPNI has beautifully designed photographer’s hides at water level so you can get gorgeous head-on photos of stilts, waterfowl and great action shots of Pied Kingfishers hovering over the water. Israel also has some wonderful resident birds and songbirds migrating through as well – beautiful desert birds like Palestinian sunbird, Crested and Short-toed Larks, plus Bee Eaters, warblers, babblers, wheatears and even Ortolans. ….and there is always the possibility of seeing ibex. After just 2 days birding in the area we saw 129 species of birds. Israel has the benefit of great birds, wonderful nature and historical places to visit. It’s easy to get around and SPNI offers birding toursin Eilat as well as other areas in Israel. Regardless of where in Israel you go, take your binos, as seeing the amazing array of birds – especially during migration – is an experience not to be missed!